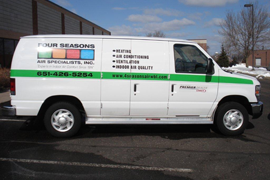 Four Seasons Air Specialists has been a leading heating & air conditioning contractor in in the greater White Bear Lake, Minnesota area since 1974. We are proud to be a Lennox Premier Dealer, as this designation supports our reputation and commitment to providing excellent customer service. This prestigious honor is only awarded to contractors who consistently deliver quality workmanship and excellent customer satisfaction. As a Lennox Premier Dealer, our technicians receive specialized factory training, and we have access to the full line of Lennox products, including the Lennox Signature Series, some of the best furnaces and air conditioners in the industry. If your furnace has ever broken down on a frigid Minnesota winter evening or, if your central air conditioner has ever failed to keep your home cool on a hot and humid summer day, you know how urgent a furnace repair or air conditioner repair can be. We can service or repair a variety of brands in a reasonable time frame. Four Seasons Air Specialists will have a qualified technician on site promptly to ensure your home or business is kept comfortable throughout the year. In addition to our repair services, we offer a planned maintenance program. Regular maintenance on your heating and cooling system can prevent the need for costly repairs, among many other benefits. Our technicians will inspect your heating and cooling units to ensure they remain operating at peak efficiency, which will save you money on your energy bills, help assure the safety of your home or business, and extend the life of your HVAC systems for many years. Our maintenance services will provide assurances that your heating and air conditioning system keeps running efficiently throughout the cold winters and hot summers. When you need a heating & air conditioning contractor in the greater White Bear Lake community, call Four Seasons Air Specialists. Customer satisfaction is our primary goal and, as a Lennox Premier Dealer, you can be assured that you will receive excellent service and the best heating, cooling, and indoor air quality products on the market. Join your neighbors and ensure you receive the best in heating and air conditioning – call Four Seasons Air Specialists today!